After spending some time thinking about my poster and how I might want to organize it, I’ve decided not to use one of my stories from the Writing the Unthinkable exercises, nothing I wrote inspired me. However, the idea and process of storytelling is highly important to me as a writer, and so writing for these exercises inspired me in general. Barry, Lynda. What It Is. Drawn & Quarterly, 2008. Print. What It Is. 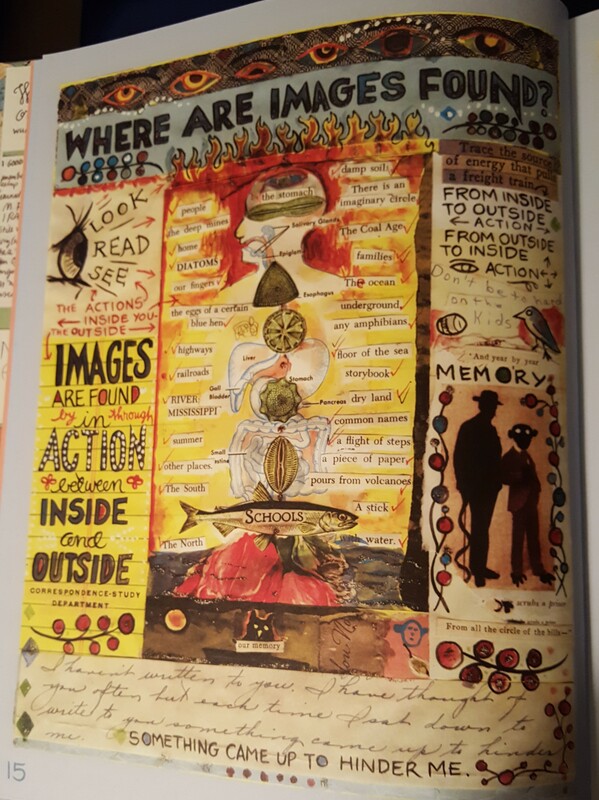 In this example from her book, it shows her collaging well in a way that has a main point or message, and adds images and text to emphasize or add to it. I would like to create my poster somewhat like this. I would like a central theme or message, and then sort of revolve my images and other text around that. And I plan to arrange a question or statement larger than the rest, which will begin the hierarchy, to show that’s a focal point and everything else falls under it. I have yet to fully decide the poster’s layout. I am not entirely certain how layering and texture might come into play exactly, as I haven’t fully decided what I’d like to scan or images to use. Layering pictures over one another could be interesting, especially since I do plan to scan some book covers and maybe text, if possible. This, it think would also help add some interesting textures into the poster. Along with the images, I want to use text, which also can be layered and stand as a form of texture. So the font chosen will play as much an important part of the poster as the images will. Overall, the poster will almost be a mimicry of Barry’s collaging, only probably a little more clean and organized, opposed to seeming completely random.